This is a good, flavorful cereal. I've been a fan of a cereal from Nature's Path called Hemp Plus Granola for many years now. 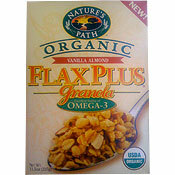 This new Flax Plus cereal tastes like an extension of that product. It has the same light crunch and hearty-yet-playful texture, but this cereal offers an authentic vanilla flavor, a nice amount of almond slivers and a touch more sweetness. Flaxseed is a tricky character when it comes to cereals (and recipes in general). Too much of it can make a product seem overly health conscience, trading the benefits of fiber and Omega-3 fatty acids for a rough, tough texture and a health food flavor. Fortunately, Vanilla Almond Flax Plus has just the right sprinkling so the flaxseed is treated almost like a spice. It adds a very subtly whole grain flavor to each spoonful. As for texture, it adds a tiny crackle to the crunch. Those interested in the organic nature of this Nature's Path product will appreciate the simplicity of the ingredients listed on the side of the box: organic rolled oats, organic evaporated cane juice, organic soy oil, organic brown rice flour, organic flaxseed, organic almonds, organic oat syrup solids, natural vanilla flavor, sea salt and organic molasses. 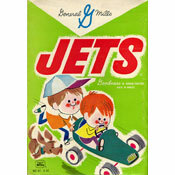 I would buy this cereal again in an instant... if the price was right. Nutritional concerns: each 3/4 cup serving contains 250 calories, 9 grams of total fat (1.5 grams saturated and 0 grams trans fat), 5 grams dietary fiber, 36 grams total carbs and 6 grams protein. The $0.0 price below reflects that the company sent Mr Breakfast a free sample of this cereal. What do you think of Vanilla Almond Flax Plus Granola?